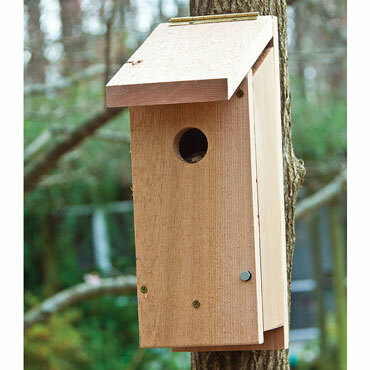 Bring beneficial, insect-eating woodpeckers to your yard and garden with this Woodpecker Next Box. It's specially constructed to accommodate Hairy, Downy, and Red-Bellied Woodpeckers as well as Flickers, with a 1.5" hole and with a box 14.5" tall. Beautiful, sturdy next box is made of cedar, and has a hinged roof and side panel that open easily for cleaning and monitoring. The box has proper ventilation and drainage, and wood shavings are included to add to the box so that they mimic natural nest sites. Mount to any tree, post, or vertical surface higher than 12 feet, and watch the woodpeckers arrive. 14.5" high x 5.25" wide, with a 9" roof.